His friendship with John Flamsteed (of Denby, Derbyshire – the first Astronomer Royal) most likely fired his interests in astronomy. 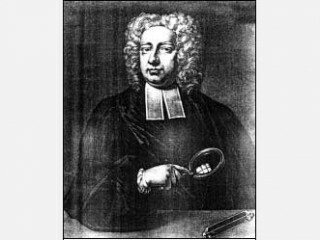 From the 1690s to 1716 Gray devoted his scientific energies to astronomical observations, quantitative and accurate, of eclipses, sunspots, the satellites of Jupiter, and the like. In a letter, of May 12th 1697, Gray informed readers of The Philosophical Transactions of the Royal Society of his use of water lenses and described a “Natural reflecting Microscope”. From all these experiments, it became clear that electrification is a surface effect; that the electric “virtue” or “fluid” would move freely along some materials-named, by Desaguliers, “non-electrics” or “conductors” – from one body to another. The earth, the human body, metals, moisture are immediately recognized as conductors. Materials which do not conduct electricity came to be called nonconductors or insulators. A metal rod or sphere when held in the hand and rubbed with fur shows no sign of electrification, but when mounted on a nonconductor, the metal is readily electrified. The electrical charge is no longer conducted away to be shared with the huge object which is the earth. When this was realized, it was found that practically any material can be electrified by friction. Gray hypothesized that electricity flows everywhere, and he paved the way for more than a generation of “electricians” – wandering scientists who made their living by demonstrating the electric current using Leyden jars. Electricians typically killed birds and other small animals with electric shock and passed electric current across rivers and lakes. View the full website biography of Stephen Gray.